Are you going gluten-free? Perhaps you’re doing an elimination diet to see if you have a gluten sensitivity. Or maybe you’ve been diagnosed with celiac disease. No matter what the reason, going gluten-free can be daunting. I gave up gluten in 2006 at the recommendation of my naturopath to improve my fertility. When she asked me to cut it out of my diet, I couldn’t stop thinking about the cupcakes at my favorite bakery. But I put my love of all things gluten-ous aside and jumped in with both feet. 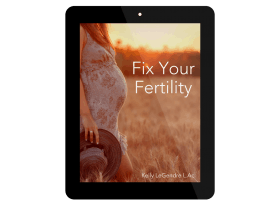 Not only did my fertility improve, but I felt so much better — my headaches disappeared, my skin cleared up, my mood improved, and my digestion regulated. As a health coach, I have helped dozens of people adopt a gluten-free diet. Through my work I have discovered a few tips to make the transition easier. 1. Don’t try to replace all of your wheat-filled favorites. It is very tempting to whip up a gluten-free cupcake mix or pick up some frozen gluten-free soft pretzels. If your goal is to improve your health, I suggest skipping the processed boxes of replacement foods. They are often higher in sugar and lack nutritional value. If you’re craving baked goods or your favorite morning pancakes, the healthiest way to get them is to bake them at home from scratch. There are numerous gluten-free recipes here on Natural Fertility and Wellness. For example, check out Donielle’s recipe for Gluten-Free Bread or this tasty recipe for Gluten-Free Sourdough Pancakes. Get creative with omelettes. Toss in your favorite vegetables and serve with a side of fruit. Need something quick? Top plain whole milk greek yogurt with blueberries, a handful of chopped walnuts and a dash of cinnamon. Or make a nutrient dense smoothie to take on the go, like this Green Breakfast Smoothie. 3. Discover delicious gluten-free whole grains. By going gluten-free you give up wheat, barley, and rye. But you also have a lot to gain. There are plenty of delicious gluten-free grains to try. Gluten-Free whole grains include amaranth, brown rice, buckwheat, millet, quinoa and teff, just to name a few. Oats are also naturally gluten-free, but are often processed in facilities alongside of gluten-containing grains. So be sure to buy oats that are labeled gluten-free. Whole grains are excellent sources of fiber, vitamins, and minerals. One of my favorite go-to grains is quinoa. Not only does it pack a nutritional punch, but it also is a complete protein, making it an excellent grain for vegetarians and vegans who need plant-based sources of protein. You can add quinoa to salads, make it as a side dish, or create hearty one-bowl meals with diced vegetables, beans, and a drizzle of olive oil. I even love it for breakfast. Whenever I make quinoa for dinner, I always cook a little extra to save for the following day’s breakfast. I serve it cold topped with diced apples, pecans, and a drizzle of pure maple syrup. Another breakfast option is Quinoa Granola, grain free and a much healthier option than overly sweetened cereals. 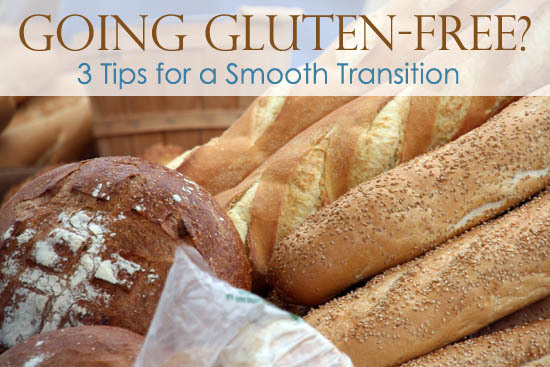 If you are currently transitioning to a gluten-free diet, I hope you found these tips helpful. If you’ve been eating gluten-free for a while, I would love for you to share your favorite gluten-free foods in the comments below. Jess is an artist, musician, writer, and lover of clean eating. 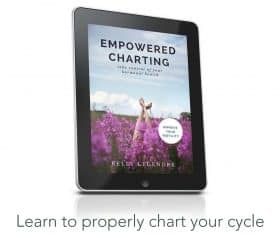 She is also a health coach specializing in helping women with unexplained infertility, PCOS, and hormone imbalances discover a holistic approach to improving their fertility and ability to conceive. Through her personal struggles with infertility and pregnancy loss, Jess has discovered her life’s purpose and is compassionate toward women who face the same uncertainty regarding their ability to have a family.